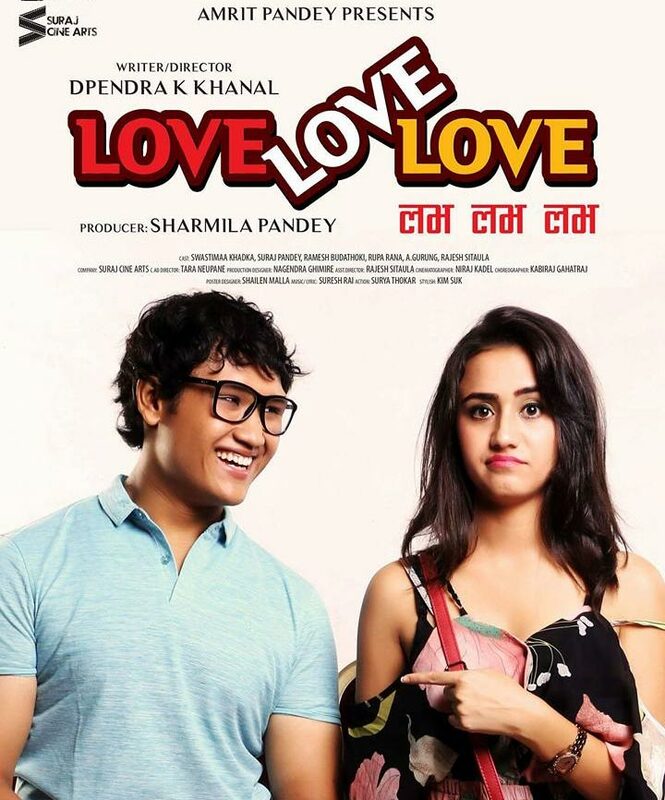 LOVE LOVE LOVE (2017 / 2074) is the Nepali movie made under the banner of Suraj Cine Arts Pvt.Ltd. The movie stars Swastimaa Khadka and Suraj Pandey in the lead role with other's supporting actors Ramesh Budathoki, Desh Bhakta khanal, Rupa Rana, A. Gurung, Aayan Khadka, Ganesh Munal, Laxmi Bhusal, Sharada Giri, Shamjhana Sirpali, Sabin Bastola, Ghanashyam Lamichhane, Tej Giri, Bhima Mainali, CP Poudyal. The movie is directed by Dipendra K.Khanal, who is known for his movies like PASHUPATI PRASAD, CHAPALI HEIGHT 2 & VIGILANTE. Those movies got a good response from the peoples, so LOVE LOVE LOVE can also be worth watching. The lead role Swastimaa Khadka debuts her movie career from the movie HOSTEL RETURNS and LOVE LOVE LOVE is the debut movie for Suraj Pandey. LOVE LOVE LOVE movie is about the two childhood friends and their love relationship when they grow up. Banner: Suraj Cine Arts Pvt.Ltd.